There was a lot in the class today so I picked out just a few elements to have a go at - still a couple of other things I'd like to try when I have more time. For obvious reasons I am not going into detail (it's a paid class) but I will say I used DecoArt Cobalt Teal Hue and Green Gold Media paints, DecoArt Tinting Base, a bright neon Limoncello Gelato (first time that's been out of the drawer - woo woo!) 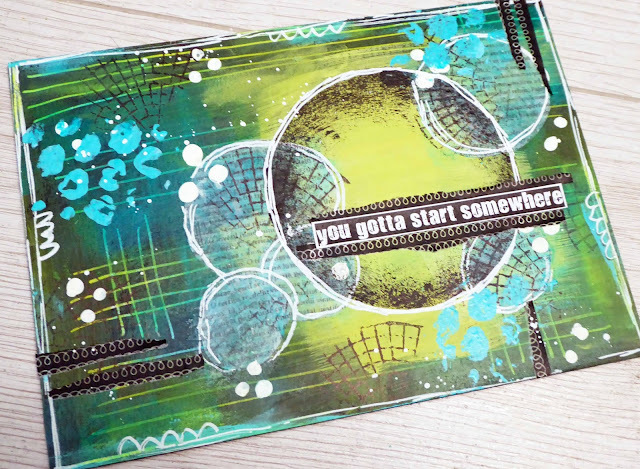 and one of Nathalie's delish stamps for Stampendous. I thought my sentiment was rather appropriate for a first go at working over black - loving my DecoArt Media paints which pop right off that dark background! I'm actually shocked at how well this turned out and it just goes to show that there's nothing to be afraid of. OK it's not brilliant - but it's also not awful and awful is definitely what I expected! Looking forward to tomorrow already - back to work in the morning but determined to make some arty time regardless. You inspire us all. What a great job. I love what you have done. Keep on posting! First off- you made me laugh so hard with the smelling salt! But what an amazing piece this is. Love all the depth and layers!!! Love it!!!! Thank you so much for sharing and being part of CJS! Woohoo!!! First project!!! It's fab Katy! For the record: I never said you couldn't add any butterflies. But I'm really glad you got over your fear of black gesso ;-). And yes, the DecoArt Media paints really are perfect for this! Thanks so much for sharing <3! True but part of the point of doing this is to try new things - in this case more abstract shapes :). This is fabulous! Kat. Love the colour combo - fantastic with the black and white! Can't wait to see more of your creative jumpstart art . Oh wow, I just watched the video. You did a great job! Have to work all week, but hope to find some time this weekend to get started. I think just try it is the best move - the way this was done was quite intuitive with mark making and brush strokes and letting it flow. I am totally a planner so caught me off guard too, but it was a lot of fun just to go with it. I decided to use some of the techniques that scared me but stick to my favourite colour scheme and add in my beloved rubber stamps so that some aspect remained comfortable. Looking forward to your make Faigie! Wow! You do great work outside your comfort zone. Oh - truly - yours turned out so neat Katy - wow. Ok - you inspired me... I'm gonna try too!!! Xj. Hi Katy, I was thinking I had left a comment yesterday! I was impressed at how quickly you got the first day lesson done. The colors are beautiful and I know I mentioned the quote as making me chuckle! Well done Katy, you wouldn't know it is out of your comfort cone it is great! brilliant!!!! The colors really "pop" from that backgroup. And yes, you gotta start somewhere. And you started great!